In the Fall of 2014, students in the first year seminar, FREN 151: Shipwrecks, Outlaws, and Wonderlands: Reading and Writing the Adventure Story, worked together to write an adventure novel of their own. The students and their professor, Pauline De Tholozany, combined the finished text and student-created illustrations into a Microsoft Word document, which LTS staff formatted to print in signatures in preparation for binding. 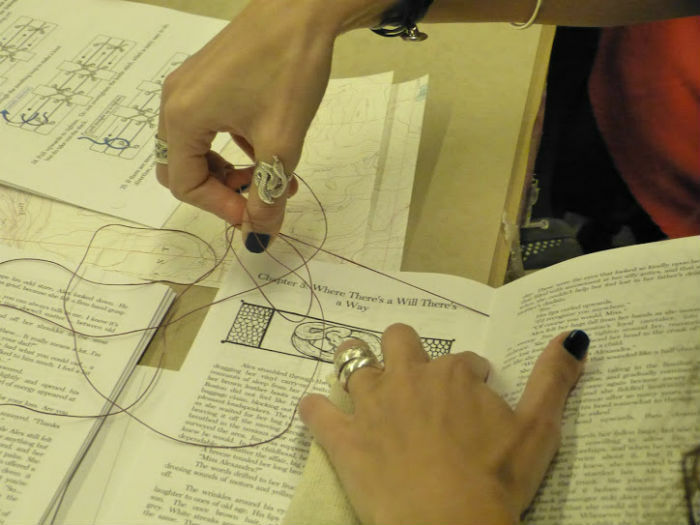 Students attended a special class session in the Book Arts Lab on the 4th floor of Clapp Library, where Katherine Ruffin guided them through hand-sewing the binding and creating covers for their novel. At the end, each student had her own printed and bound copy of their novel.